Tired of Boring Jack-O-Lanterns? 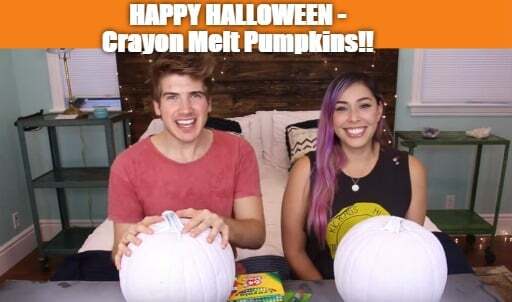 Spice UP Your Home With a Crayon Melt Pumpkin This Fall! Although it is hard to believe, Halloween is just over 2 weeks away! Decorating for autumn and Halloween can be so much fun. However, the same old DIY fall decor can get a little boring. 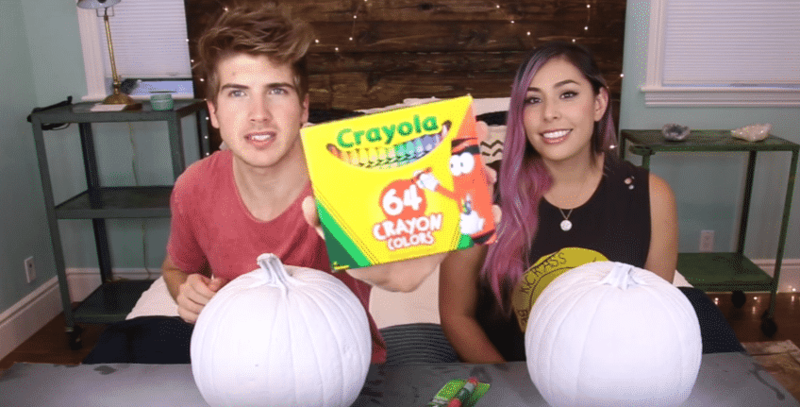 This year, why not spice things up a bit with with a rainbow crayon pumpkin! 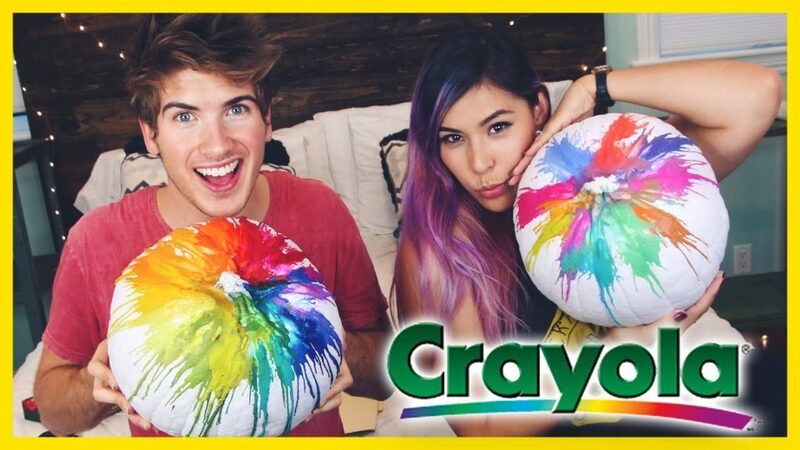 My very favorite Youtuber, Joey Graceffa, and his pal Tiffany dedicated a video specifically on the 411 on how to create a rainbow pumpkin by melting crayons with a hair dryer! 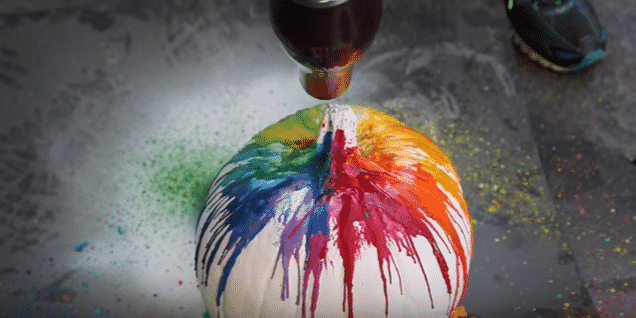 The process to making a decorated crayon pumpkin is simple but a little messy (probably messier than traditional pumpkin painting)! Read on to find more. Newspaper or some sort of floor cover/wall cover (this is optional, but if you are doing this project inside you will definitely want to cover your floor and the walls around you). Begin by peeling the wrappers of the crayons you plan to use. You can use whatever colored crayons you want, just keep in mind the colors will bleed together and may create undesirable colors. Glue the crayons around the top of the pumpkin. You can either break the crayons in half or into smaller pieces as you glue them. Once the glued on crayons have dried on, turn on your hairdryer and start melting those crayons! Move the hairdryer around the pumpkin and watch the crayons melt! Allow the wax to dry, and your pumpkin will be all ready to go! Happy rainbow crayon pumpkin decorating! If you live along the upper east coast of the United States, you are probably preparing for the impending snow storm that is expected to hit sometime between Friday night and Saturday morning. Hopefully at this point you have all the food and supplies you might need during the storm. Snowstorms like this one are good excuses to spend your weekend relaxing at home. You can get cozy in your warmest pajamas and heat up a nice cup of coffee or tea and enjoy the snow day (or days!) Although snow storms can be relaxing or romantic, they can also make some people feel bored and even a little stir-crazy. To deal with those feelings of boredom, why not do some fun, cheap crafts that will preoccupy you and your family while the flakes fly! We even have some fun and easy ideas for DIY crafts for kids. Have your children create edible snowmen out of marshmallows. This project works best with jumbo sized marshmallows. You can use chocolate chips, mini M&Ms, or food coloring to make eyes and pretzel sticks or spaghetti noodles for arms. Microwave your snowman for a few seconds to make an ooey gooey treat. Make a beautiful decoration for your front door from pine cones, paint, glitter, ribbon, hot glue, and plastic snowflakes. Paint white paint down over your pine cones. Before the paint dries, sprinkle white or silver glitter over the pine cones. At one end of each pine cone, tie or hot glue ribbon (it looks best with white ribbon) to the base of the pine cone. Attach a piece of ribbon to your small plastic snow flakes. 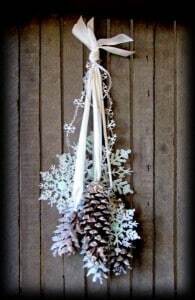 Once your pine cones have dried, tie the ribbons from each pine cone and plastic snow flake together in a knot. Hang this lovely winter decoration from your door! Put food coloring in spray bottles with water and have your children create beautiful works of art out in the snow. Create detailed paper snowflakes by folding white paper into a square. Make numerous cuts into your paper with scissors to create a beautiful snowflake that can be hung from your ceiling or windows! Your children might enjoy these FREE printable coloring pages for kids. These pages are winter weather themed, but there are other types of coloring pages as well. Create your own easy winter wreath with a foam hoop, tulle (in white, blue, and/or silver), small plastic snow flakes, and small color coordinating colored balls (Christmas balls work well). Cut strips of tulle that are all the same length. Then, tie them tightly around the foam hoop. Alternate colors as you tie the tulle around the hoop. Continue tying the tulle until you have it completely encircling the hoop. Then, hot glue the snowflakes and Christmas balls around the perimeter of the hoop. Voila, you have a beautiful winter wreath! Indoor picnic ideas are also great for snowy days. You can let your children help you plan and prepare the food. Get a nice picnic blanket out and feast on your tasty indoor picnic meal while you watch the snow fall. Have a safe and enjoyable snow day (or multiple snowy days if you live in the mid Atlantic region too)!